Installing Entrance Matting in countries like Germany, Qatar and Poland, INTRAsystems is truly becoming a global player in the Entrance Matting industry. 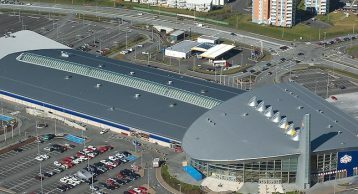 Our latest installation takes us to Kópavogur, Iceland where we installed our Matting in a popular shopping centre – Smáralind. 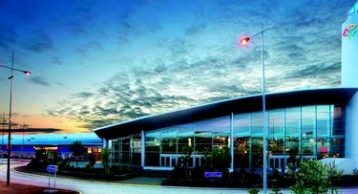 This shopping mall is located in the city centre of Kópavogur and covers 65,200 square meters, it is one of the biggest shopping malls in Iceland, with over seventy shops, restaurants, and services. Intrasystems worked with the client in installing INTRAform Entrance Matting. There were two main entrances which needed to be covered. One was a revolving door where our rubber inserts were chosen for their durability. At the first-floor entrance where the anthracite 607 Elite Polyamide Fibre Insert was used which is designed for optimum performance and aesthetics in all commercial applications. Made with 33% recycled Econyl yarn it carries excellent environmental credentials. It is also known for its effective moisture absorption properties where it can absorb 5.4l/m². For a shopping centre like Smaralind using sustainable materials is a massive bonus. We all know the advantages Entrance Matting; from customer retention to reduced cleaning costs to increased longevity of the building. No wonder more and more shopping centres are using proper aluminium Entrance Matting to prevent the ingress of dirt and moisture into the building and help keep their shoppers safe. These advantages made choosing the right product to be installed in this excellent shopping centre easier.